“Not all superheros wear capes , some wear scarves”. Summers can be a long scorching battle but scarves can definitely come to your rescue. They are a fun accessory and a wardrobe essential, and can change the complete look of an outfit in a second. The whole idea of summers is to keep comfort in check without looking too mundane. Draping an extra layer of fabric around your neck in the middle of June might sound a little bit off. But trust us, a light, simple style will lift any outfit and add a touch of nonchalant cool. Unfortunately, sometimes the heat causes us to spiral into a style rut — hair can go a little limp when you wear it down, and you can only wear a plain pony so many times before you start to get sick of it. That's where a simple scarf comes in handy. Have some fun and don't let the countless options tie your brain in a knot. Now that you have your perfect accessory, you're well on your way to a breezy summer style. Fold a long scarf, longways, and wrap it around your hairline. Tie off the scarf at the nape of your neck and pull the end of the scarf to one side of your neck so you can see it when you look straight into the mirror. Tie the ends into a bow for an extra-cute look. Show your inner pirate rock by tying your scarf to bandana into a wide band and wrapping over long locks. Stretch out a large scarf around your forehead, and bring the ends of the scarf around to the back of your head then tie off the scarf in a firm, but comfortable, bow in the lower back of your head (the scarf should rest at the nape of your neck). This separates the chic look from the pirate look. Fold a large scarf longways and rest it onto the back of your head. Wrap the ends to the front of your head and tie them on your hairline. After that, tightly twist the ends of the scarf and wrap the twisted ends to the back of your head before tying them into a double knot. Make a side braid. Take a short scarf and fold it, longways, so that it's thin, then wrap the scarf around your hairline and tie it off where your side braid begins. The tie will make the braid look "fancy". Add cute boho sunglasses and some funky jewellery to complete the look. 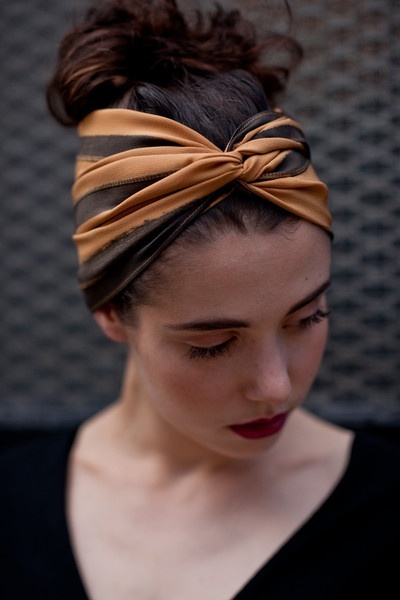 Fold a large or small scarf longways and wrap the scarf around your neck and bring the ends up to the top of your head. Tie the ends into a bow at the top of your head. Tweak the scarf so it sits a bit to one side and adds "sassy" to the look. Fold a large scarf in half to create a triangle. Place the largest straight end onto the top of your head and bring the scarf ends forward and criss-cross them lightly under your chin. Take the ends back and tie them loosely or make a pretty bow. So vintage yet so chic. From retro to boho, there's a million different looks you can create with a scarf, and many styles either help keep your hair out of your face or add a little perk to your summer outfits as well.